Hmmm…looks like Australia…some Very Large Array type radio receiver? I expect that’s not precise enough; however, I do like Thin Mints! Well, it is part of a radio telescope array, but the ones in Australia look like weird tiles of 16 metal spiders not beg dishes. So, try again? 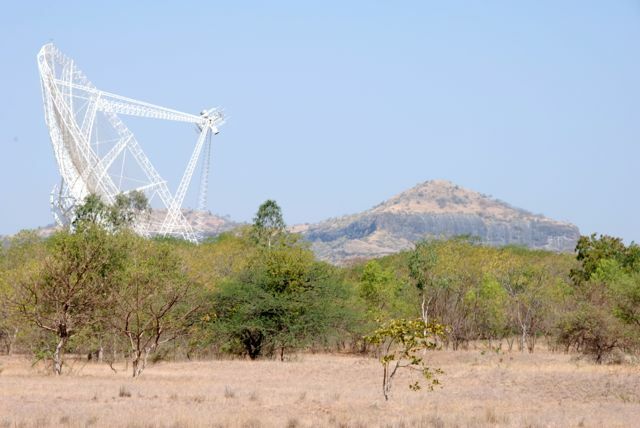 The picture is of the Giant Metrewave Radio Telescope (http://en.wikipedia.org/wiki/Giant_Metrewave_Radio_Telescope) near Pune, India and the hill in the distance is an exposure of the Deccan Traps. I’m finding it pretty hard to match the exact vegetation to nail down your shooting location, but my best guess at the moment would be about 19.094731°N, 74.046040°E looking in a ESE direction, presuming it’s an afternoon shot. Best vegetation match suggests you’re in the main cluster of the array, and now out on one of the satellite Y arms. The call on the time of day, though, is slightly off. We ended up touring around the array mid to late-morning — during the heat of the afternoon we hung out instead in the server room (only place with AC). Type of cookies you want? Edit: …and NOT out on one of the satellite Y arms. Hey Ron…maybe I need to come over and get a bit more help with the thin mints…I mean thin sections!